The Galápagos Islands are renown for their unique flora and fauna, inspiring Charles Darwin in the elaboration of his theory of evolution. Yet in his Voyage of the Beagle, published in 1839, Darwin also remarked on the fascinating geology and volcanic origin of these enchanted Islands. Since then, the Galápagos continue to provide scientists with inspiration and invaluable information about ocean island formation and evolution, mantle plumes, and the deep Earth. Motivated by an interdisciplinary Chapman Conference held in the Islands, this AGU volume provides cross-disciplinary collection of recent research into the origin and nature of ocean islands, from their deepest roots in Earth's mantle, to volcanism, surface processes, and the interface between geology and biodiversity. 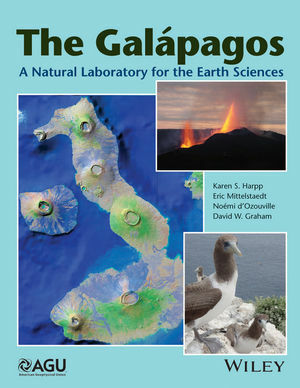 Collectively, The Galápagos presents case studies illustrating the Galápagos Archipelago as a dynamic natural laboratory for the earth sciences. This book would be of special interest to a multidisciplinary audience in earth sciences, including petrologists, volcanologists, geochronologists, geochemists, and geobiologists. Karen Harpp is a geochemist and volcanologist in the Geology Department at Colgate University, in upstate New York, USA. She and her students have been exploring the Galápagos for many years, studying the origins of the volcanic islands across the archipelago using land- and sea-based research methods. Eric Mittelstaedt is a geodynamicist and geophysicist in the Department of Geological Sciences at the University of Idaho. Using geophysical data, and numerical and analogue experiments, he studies the interactions between mantle dynamics, and surface tectonics and volcanism in the Earth’s ocean basins. David Graham is an isotope geochemist in the College of Earth, Ocean, and Atmospheric Sciences at Oregon State University. He specializes in using noble gas measurements of volcanic rocks from the oceans and continents to investigate geodynamics of the Earth's mantle. Noémi d'Ozouville is a post-doc at the University Pierre et Marie Curie, Paris 6, France. She lives in the Galápagos Islands where her research activities include the hydrology and hydrogeology of volcanic ocean islands through a combined approach of remote sensing, geophysical data and hydro-climatological monitoring, data collection, and analysis. She continues to play an important role in conservation and water management in the islands. She now works at the Charles Darwin Research Station as Science Administrator.